We offer Homing Centre visits, seminars, workshops and classes to educate the public, the aim of which is to improve dog-human understanding and so reduce the number of pets being abandoned. We are also frequently invited by various media to take part in interviews, contribute to columns and participate in or host public events to help spread the message and promote HKDR’s work. We would love to hear from you about how we can work together to help the abandoned dogs in Hong Kong. Please fill in the form below or email our Education & Training Manager, Cactus Mok, at education@hongkongdogrescue.com for details. 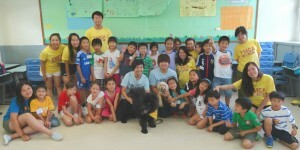 We encourage adult groups to visit our Tai Po Homing Centre to understand our daily operation and challenges up close. 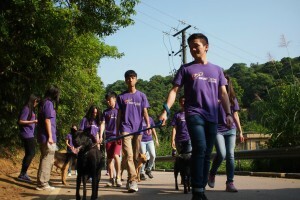 It usually includes an introduction of HKDR background and work, existing dog welfare situation, followed by a tour of the Homing Centre and dog walking. We welcome requests for delivering talks at your school, workplace or organisation to share our experience in rescuing, rehabilitating and rehoming dogs, responsible pet ownership, dog training or any topics of interest. Pets can play a vital role in creating a happy childhood, and there are many lovely animals to be found in story books, toys, songs and cartoons. 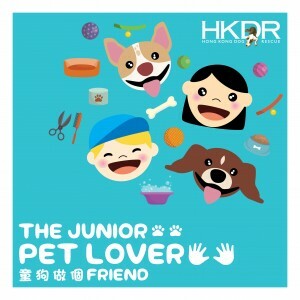 Understanding the special connection between children and animals, we specially design “The Junior Pet Lover” workshop to offer an opportunity for children to learn about animal welfare, and to build a sense of responsibility in taking care of and protecting animals through various interactive activities, thereby helping them to develop a respectful attitude towards life. “Pawsome” Adventure – Through a series of adventure-based activities at the big pet supplies store Whisker N Paws, children will learn the basics of taking care of dogs. Hello Dogs – Meet the dogs in person and learn how to interact safely with them using appropriate dog-friendly techniques. The deep talk – In-depth discussion and reflection on public and civic responsibilities with guidance from mentors. We are happy to provide support and guidance to student groups, individuals or media who are doing projects related to animal welfare. Please email education@hongkongdogrescue.com for details. We have a lot of experience to support various groups in organising educational/charity projects and/or fund-raisers, with the aim of spreading the message of responsible ownership to the general public, and to help raise much-needed funds.